I feel sorry for insulin. Insulin has been bullied and beaten up. It has been cast as an evil hormone that should be shunned. However, insulin doesn't deserve the treatment it has received. Insulin is a hormone that regulates the levels of sugar in your blood. When you eat a meal, the carbohydrate in the meal is broken down into glucose (a sugar used as energy by your cells). The glucose enters your blood. Your pancreas senses the rising glucose and releases insulin. Insulin allows the glucose to enter your liver, muscle, and fat cells. Once your blood glucose starts to come back down, insulin levels come back down too. This cycle happens throughout the day. You eat a meal, glucose goes up, insulin goes up, glucose goes down, and insulin goes down. Insulin levels are typically lowest in the early morning since it's usually been at least 8 hours after your last meal. Insulin doesn't just regulate blood sugar. It has other effects as well. For example, it stimulates your muscles to build new protein (a process called protein synthesis). It also inhibits lipolysis (the breakdown of fat) and stimulates lipogenesis (the creation of fat). However, this logic is based on many myths. Let's look at many of the myths surrounding insulin. After meals, fat is deposited with the help of insulin. However, between meals and during sleep, fat is lost. Fat balance will be zero over a 24-hour period if energy intake matches energy expenditure. This is just a rough chart that I made, but the green area represents the lipogenesis occuring in response to a meal. The blue area represents lipolysis occuring in response to fasting between meals and during sleep. Over a 24-hour period, these will be balanced assuming you are not consuming more calories than you expend. This is true even if carbohydrate intake is high. In fact, there are populations that consume high carbohydrate diets and do not have high obesity rates, such as the traditional diet of the Okinawans. Also, if energy intake is lower than energy expenditure, a high carbohydrate diet will result in weight loss just as any other diet. One of the biggest misconceptions regarding insulin is that it's needed for fat storage. It isn't. Your body has ways to store and retain fat even when insulin is low. For example, there is an enzyme in your fat cells called hormone-sensitive lipase (HSL). HSL helps break down fat. 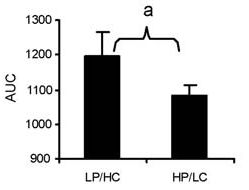 Insulin suppresses the activity of HSL, and thus suppresses the breakdown of fat. This has caused people to point fingers at carbohydrate for causing fat gain. 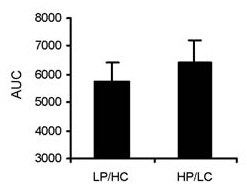 However, fat will also suppress HSL even when insulin levels are low. This means you will be unable to lose fat even when carbohydrate intake is low, if you are overeating on calories. If you ate no carbohydrate but 5,000 calories of fat, you would still be unable to lose fat even though insulin would not be elevated. This would be because the high fat intake would suppress HSL. This also means that, if you're on a low carbohydrate diet, you still need to eat less calories than you expend to lose weight. Now, some people might say, "Just try and consume 5000 calories of olive oil and see how far you get." Well, 5000 calories of olive oil isn't very palatable so of course I won't get very far. I wouldn't get very far consuming 5,000 calories of pure table sugar either. 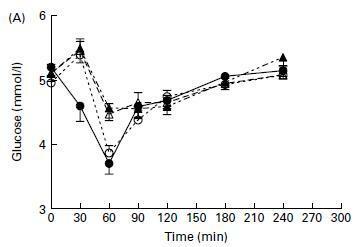 You can see that, despite the fact that the blood sugar response was much higher in the meal with more carbohydrate, the insulin response wasn't higher. 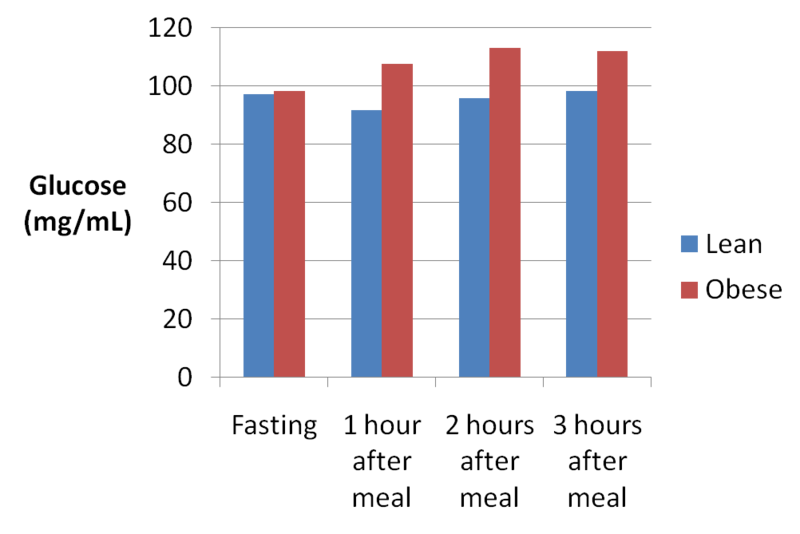 In fact, the insulin response was somewhat higher after the high protein meal, although this wasn't statistically significant. Some people might argue that the "low-carb" condition wasn't really low carb because it had 75 grams of carbohydrate. But that's not the point. The point is that the high-carb condition had nearly TWICE as much carbohydrate, along with a HIGHER glucose response, yet insulin secretion was slightly LOWER. The protein was just as powerful at stimulating insulin as the carbohydrate. I can also hear arguments coming like, "Yeah, but the insulin response is longer and more drawn out with protein." That wasn't true in this study either. You can see in the chart that there was a trend for insulin to peak faster with the high protein condition, with a mean response of 45 uU/mL at 20 minutes after the meal, versus around 30 uU/mL in the high carb condition. You can see that all of these proteins produced an insulin response, despite the fact that the carbohydrate in the shake was low. 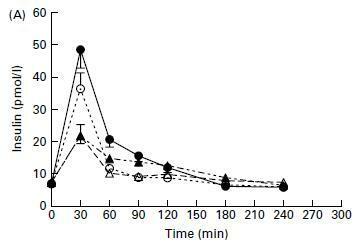 There was also different insulin responses between the proteins, with whey producing the highest insulin response. The subjects ate nearly 150 calories less at lunch when they had whey protein, which also caused the greatest insulin response. 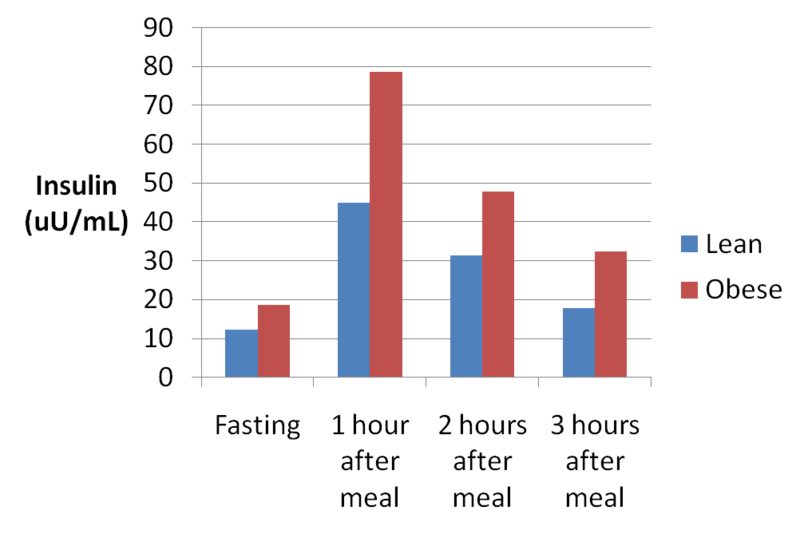 In fact, there was an extremely strong inverse correlation between insulin and food intake (a correlation of -0.93). 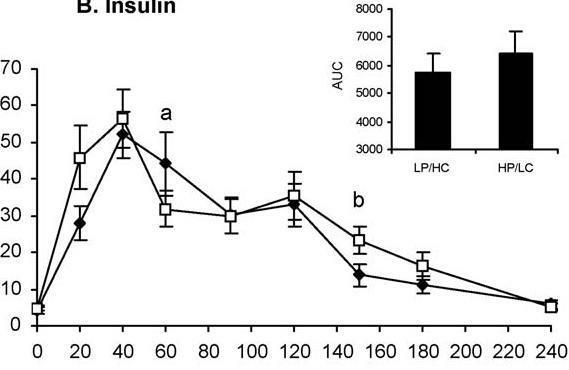 You can see that the insulin response was exaggerated in the obese subjects, probably due to insulin resistance. Here's a chart of the blood glucose response. You can see there was no relationship between the glucose response and insulin, which was similar to the study discussed earlier. The fact is that protein is a potent stimulator of insulin secretion, and this insulin secretion is not related to changes in blood sugar or gluconeogenesis from the protein. In fact, one study found beef to stimulate just as much insulin secretion as brown rice. The blood sugar response of 38 different foods could only explain 23% of the variability in insulin secretion in this study. Thus, there's a lot more that's behind insulin secretion than just carbohydrate. So how can protein cause rapid rises in insulin, as shown in the whey protein study earlier? Amino acids (the building blocks of protein) can directly stimulate your pancreas to produce insulin, without having to be converted to glucose first. For example, the amino acid leucine directly stimulates pancreas cells to produce insulin, and there's a direct dose-response relationship (i.e., the more leucine, the more insulin is produced). Some might say, "Well, sure, protein causes insulin secretion, but this won't suppress fat-burning because it also causes glucagon secretion, which counteracts insulin's effects." I mentioned earlier how insulin will suppress lipolysis. Well, some people think that glucagon increases lipolysis to cancel this out. The thought that glucagon increases lipolysis is based on 3 things: the fact that human fat tissue has glucagon receptors, the fact that glucagon increases lipolysis in animals, and the fact that glucagon has been shown to increase lipolysis in human fat cells in vitro (in a cell culture). However, what happens in vitro isn't necessarily what happens in vivo (in your body). We have a case here where newer data has overturned old thinking. Research using modern techniques has shown that glucagon does not increase lipolysis in humans. 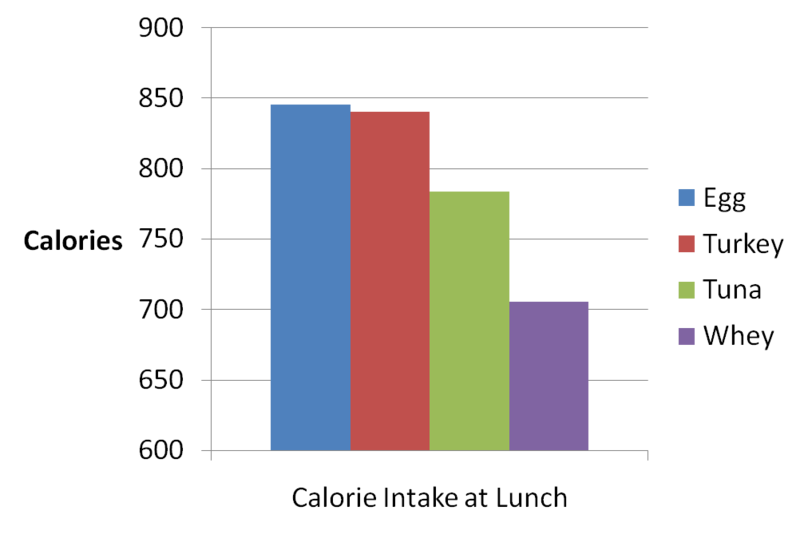 Other research using the same techniques has shown similar results. I will also note that this research failed to find any lipolytic effect in vitro. It should be remembered why glucagon is released in response to protein in the first place. Since protein stimulates insulin secretion, it would cause a rapid drop in blood glucose if no carbohydrate is consumed with the protein. Glucagon prevents this rapid drop in blood sugar by stimulating the liver to produce glucose. The fact is that insulin is not this terrible, fat-producing hormone that must be kept as low as possible. It is an important hormone for appetite and blood sugar regulation. In fact, if you truly wanted to keep insulin as low as possible, then you wouldn't eat a high protein diet...you would eat a low protein, low carbohydrate, high fat diet. However, I don't see anybody recommending that. I'm sure some are having some cognitive dissonance reading this article right now. I know because I experienced the same disbelief years ago when I first discovered this paper and how protein caused large insulin responses. At the time, I had the same belief that others have...that insulin had to be kept under control and as low as possible, and that spikes in insulin were a bad thing. I had difficulty reconciling that study and my beliefs regarding insulin. However, as time went on, and as I read more research, I learned that my beliefs regarding insulin were simply wrong. Now, you may be wondering why refined carbohydrates can be a problem. Many people think it's due to the rapid spikes in insulin. However, it's obviously not the insulin, because protein can cause rapid spikes in insulin as well. One problem with refined carbohydrate is a problem of energy density. With refined carbohydrate, it is easier to pack a lot of calories into a small package. Not only that, but foods with high energy density are often not as satiating as foods with low energy density. In fact, when it comes to high-carbohydrate foods, energy density is a strong predictor of a food's ability to create satiety (i.e., low-energy density foods create more satiety). There are other issues with refined carbohydrate as well that are beyond the scope of this article. The bottom line is that insulin doesn't deserve the bad reputation it's been given. It's one of the main reasons why protein helps reduce hunger. You will get insulin spikes even on a low-carb, high-protein diet. Rather than worrying about insulin, you should worry about whatever diet works the best for you in regards to satiety and sustainability. As mentioned in a previous article, individual responses to particular diets are highly variable and what works for one person will not necessarily work for another. I will be writing a post in the future on the need for individualized approaches to nutrition. Click here to read part 2 of this series on insulin. —then it wasn’t “somewhat higher” The 95%CI likely contained “ZERO” and inverse values (opposite signs). Not statistically significant is akin to saying “no difference detected.” If you’re going to play the statistical significance “game” then play by the rules. Of course the CI would contain zero and inverse values. Of course a lack of statistical significance is akin to saying “no difference detected.” I was simply making a factual comment that the raw mean value was somewhat higher; I did not intend to imply that this represents a true difference, which is why I stated that the difference was not statistically significant. That comment is not true. Not having statistical significance does not akin to saying “no difference detected.” That is a fundamental misunderstanding of the concept. Statistical significance says how likely it is that the difference is a chance artifact that might come from chance distribution of values. It does not say whether or not a difference was detected, rather than that, it tells you how likely it is, that this is just happening by pure randomness. A 0.1 significance still “only” says that there is a 10% chance that things are chance. In psychology, we use everything below 0.05 for our work. 0.1 is still good, but not good enough for low powered effects. 1. 33% to 50% of all insulin is used for basal needs. That’s a huge omission from your argument. The more carbs you eat, the more glycogen you store, the more sugar your liver relases. The release is constant. It never shuts off. Those of us who monitor basal insulin find our usage drops incredibly by eating low carb. Mine has fallen from 24u a day to 15u on zero carb eating. 2. Do you know anybody that only eats three meals a day? Watch any vegan video. They are constantly munching on bananas or some tropical fruit they don’t even realize is unavailable in most of the world. SADers line up for late night Big Macs and Whoppers. Donut shops constantly spit out their crap. Try buying a decent apple fritter at Tim Hortons after 10:30 in teh morning. This blog.article is completely selective and and pointless. Your full of crap and if your consuming zero carbs that means your not eating fruit or vegetables which is highly unhealthy. You should be dead soon idiot..
“your not eating fruit or vegetables which is highly unhealthy” — because you know, throughout human evolution we’ve been shipping fruits and vegetables that are out of season halfway across the world. Nobody needs to eat fruit, it comes in the fall as a dietary signal to gain weight for winter. Vegetables have some vitamins that you don’t get from eating muscle tissue, but you certainly get enough if you are eating fat and organs. The idiot would be the person who thinks you die if you don’t eat fruits or vegetables. Do a bit of reading next time before commenting. I’m a type-1 diabetic for 37 years. I have no diabetic complications and run an A1C near 6. So you can assume I have done a pretty good job of maintaining my Blood Glucose (BG) and have a good grasp on the effect of food/insulin on one’s BG. Yes, the chart you referenced is a simplification of the insulin process (which is why the author calls it a “rough chart”), but it correctly conveys the point he’s making about lipogenesis and lipolysis in a clear visible manner. Often, when diabetics go on a careful diet, they also start monitoring their BG more often, eat more consistent amounts of carbs/protein/fat, actually decrease their total caloric consumption, and gain overall better BG control. It is that improved control (more stable) BG and/or reduced calories that lowers ones overall insulin requirements, not switching gram for gram from carbohydrate to protein. Even at the exact same caloric intake (same percentage of Carbs), T-1’s will require less total insulin throughout the day if they keep their BG fairly stable than if they are on the BG roller-coaster. So your change to a “zero-carb” (which, as the other responder said, is very unhealthy) resulted in a lower basal because of better BG control and/or less calories consumed. I’m no scientist but. . . looking a that top graph. If I lowered or eliminated the green peaks by reducing or eliminating carbs, I would lose more fat, and form little or no fat. So if Iwant to lose weight, I shoud reduce/eliminate carbs, no? I guess I’m missing something. Insulin is not directly responsible for fat storage; If you eat an excess of calories, you will gain fat regardless of how you control blood sugar (and insulin). The important thing to note from this article is that it’s not just carbohydrates that stimulate the release of insulin– Protein does as well. It’s also worth noting that the green peaks are not what you should be focusing on– The blue sections are more important because this is when there is nothing inhibiting lipolysis, and your body can utilize beta-oxidation (Utilizing body fat for fuel) as it’s metabolic process. I used to be all about ketogenic diets (high fat, low carb), but the more research I do on bioenergetics, the more I realize that it’s not necessay; I still recommend and eat low carb, but that’s because I’m a fan of eating only clean foods, and not eating refined sugars. Based on what you ve written about appetite his claim is wrong, right? Also whats your take on big meals in general? Yes, his claim is wrong. Hyperinsulinemia is not associated with stimulation of appetite. In fact, his claims makes absolutely no sense at all. Big meals are not associated with appetite stimulation, and there is not a single controlled study to support this Greek nutritionists claim. I have no problem with big meals as long as total energy intake over a 24-hour period is well controlled. Some intermittent fasters like Martin Berkhan have big meals and stay remarkably lean. It is when you have big meals all of the time so that your total energy intake is high; that’s where it then becomes a problem. Am I the only one noticing that some “myths” are not actually myths, and that in some cases the “facts” do not even try to directly address the myths? “MYTH:A High Carbohydrate Diet Leads to Chronically High Insulin Levels”. Does anyone really believe this? I mean, aside from the fact that a HC junk diet WILL usually make you hungrier, leading to more frequent eating, leading to more time slices of elevated insulin. So either the myth here is a strawman, or it is severely misrepresented. “MYTH: Insulin Makes You Hungry”. Has this been the basis of any argument for low-carb approaches? Seriously, I have never come across this myth either. The fact does not address the myth in ANY way. Please think these posts through a bit more carefully. Actually it does refute it, because it is the low-carb camp that claims that insulin is the primary fat storage hormone, and all you need to do to lose fat is to keep insulin low. But this is refuted by the fact that the body can synthesize and store just as much fat when insulin is low as it can when it is high. I’ll disagree: the body “can” synthesize and store just as much fat, but in reality it doesn’t given an excess LCHF diet as opposed to HCLF or SAD diet. When we try to lose or gain weight using these two diets, with the same amount of calories, the bodies response is different. Cals in/out thermodynamics may still apply but the bodies hormonal response and subsequent loss/gains, metabolic rate are different. So to get the body to synthesize protein to fat will be exponentially more difficult in reality. The reality is you can’t overeat protein like you can processed carbs. It is a metabolic ward study (very good for studying weightless since it doesn’t rely on self-reporting). Study participants lost weight on a high complex carb diet. Then switched to a high fat diet with the same amount of calories. They still lost weight but the weightloss slowed. This doesn’t support the keto hypothesis. MYTH:A High Carbohydrate Diet Leads to Chronically High Insulin Levels”. Yes, there are plenty of people in the low-carb camp that believe this. Yes, but insulin is not the mechanism behind how junk diets will make you eat more. Rather, it is related to energy density as well as food/brain reward mechanisms. Yes, it has been the basis. Even Taubes insinuates this in his book, by citing some data showing how people eat a lot after injecting insulin (while leaving out the important information that it’s with a supraphysiological dose of insulin leading to severe hypoglycemia, which has not relevance to normal physiological swings in insulin due to food intake). The fact does not address the myth in ANY way. I am overweight and insulin resistant, the reason I am overweight is because when I eat carbs (ignoring simple vs complex) I have a much higher insulin response than non-insulin resistant people, this response sends the excess glucose in my blood to fat cells. The sudden drop in blood glucose means my cells are no longer being fed, and they in turn send signals of hunger, and the process repeats. The alternative is that with a high fat, low carb, and controlled protein diet, I avoid these spikes in insulin and since fat is much more satiating over long periods of time my cells aren’t constantly asking for the energy insulin was robbing them of. The result is I am burning fat for most of the day. How do you know that this is happening? Have you been given labelled glucose so that you can track where the glucose is going? Your statement here is actually contradictory. Yes, if you are insulin resistant, you will have a higher insulin response to feeding than someone who is not. However, this will NOT drive “excess glucose into your fat cells.” If you are insulin resistant, then your cells are not as responsive to insulin. So the reason for the higher insulin response is to get the SAME cellular response in terms of glucose uptake as someone who is not insulin resistant. In fact, being insulin resistant DECREASES glucose uptake into fat cells…it does not increase it. There are a number of studies on this when I can link you to if you wish. There is also no scientific evidence that fat is “more satiating over long periods of time.” In fact, the wealth of scientific data indicates the opposite. “Avoiding spikes in insulin” is not the goal of someone who is insulin resistant. Increasing insulin sensitivity is. Fat oxidation also has nothing to do with insulin. If you want to “burn fat most of the day”, you need to be in an energy deficit…the macronutrient profile is largely irrelevant. I never even considered the potential negative effects of insulin before reading a post 3 days ago. Medical News Today had an article about the connection between insulin use and obesity recently and i checked out a briefing about the link in “Cell Metabolism”. I think you may be a bit closed minded…I have seen the negative effects and there’s a lot of research supporting this. I am not close minded, Ana. I am well read, and I consider ALL the available data, and consider where the weight of the evidence lies. I’ve seen the Cell Metabolism article as well. But the Cell Metabolism article does not refute the overwhelming data that indicates that insulin does not deserve the bad reputation it has received. If there’s “a lot of research” supporting what you perceive to be “negative effects”, then please provide it, with references and details of the articles, as well as how this research represents the overall weight of the evidence regarding insulin. Ive been scouring the internet for articles like this and thank you for giving us the info. If a person were to be insulin resistant and find themselves in a state where insulin levels are high (and constantly so throughout the day), wouldnt that inhibit fat loss (not just weight loss; which as we know can come in many forms, ie: water, LBM)? Also, from some of the articles Ive read, Insulin can inhibit fat loss but it also plays a role in gaining lean body mass (muscle in particular) if utilized at the right time; taking in carbs/protein during that window when insulin levels are high. Would this be correct? Im hoping someone can shed some light on this. I ask because Im an obese male (with most of my fat in the middle) and in my process of dieting and exercise, I find myself losing very little fat after a month (less than a % of fat loss). My conclusion is that maybe my insulin levels are constantly high. Obviously I would need to see a doctor to get a checkup but dont have insurance and would rather pinpoint where the issue would lie before spending hundreds of dollars on checkups and tests. Thanks for your comment. Even in a state of insulin resistance with higher baseline insulin levels, it would still not inhibit fat loss if you are in an energy deficit. This is because the higher insulin are because of the insulin resistance; the insulin “signal” is still the same, it just takes more insulin to do the same thing in a state of insulin resistance. So there would be no net detriment to fat balance. In fact, some research shows that insulin resistance predicts *less* weight gain over time, not more. Where insulin resistance may become an issue is if you have insulin and leptin resistance in the brain, which can lead to disturbed appetite regulation. You end up eating more without feeling as satisfied. There is a lot of interesting and useful information in this article, but I can’t help feeling that something is missing. For most of my life I’ve been a big sugar eater, going through a litre or more of sugary drinks each day and consuming high amounts of bread, potatoes, rice, and sweet sugary foods. I’ve always maintained a slightly wobbly belly, though never got really fat. Earlier this year, as an experiment in order to try and lose that belly fat and get a look at the abs underneath, I went on a low-carb diet for 3 months, eating no rice/potatoes/pastas/sweets/soft drinks etc. As far as carbs, I had only veg, fruit, milk, and nuts, and aside from those my diet was high in very oily meat and tofu dishes (living in China!). For the first time in years, with little change to my exercise regime and possibly even an increase in my caloric intake (I had LOTS of fat each day from peanut butter, pork, and beef), I lost 5kg, and started to see definition in my belly. In 3 months this might not sound like a lot, but I’ve never been able to do that before. Note that nowhere in my post did I claim that reducing carbohydrate intake does not help people with fat loss. There have been many cases where it has, but insulin is not the mechanism. People need to be very careful about assuming mechanisms for things that worked for them in what is a completely uncontrolled, unscientific environment. Well, I think Dr. Lustig (among others) has found the missing link. The problem is HFCS (high fructose corn syrup), which was introduced in 1970s. This cra*p is found in almost any processed products found on the grocery store shelves because it’s a very cheap way making stuff tasty (i.e. making cardboard palatable). Virtually every cell in the body can use glucose for energy. In contrast, only liver cells break down fructose (this is similar to how alcohol is metabolized). What happens to fructose inside liver cells is complicated. One of the end products is triglyceride, a form of fat. Thus, fructose metabolism generates lipogenic substrates, which are delivered straight to the mitochondria, in an unregulated fashion. In layman’s term; it goes straight to the cell WITHOUT the help of insulin…. John, Dr Lustig’s assessment of HFCS is completely off-base. He is wrong on so many things about fructose and HFCS, I don’t even know where to begin. For a start, I suggest you read Alan Aragon’s critique of one of Dr. Lustig’s lectures on fructose. Here is a scathing review of Lustig’s book, and all of the scientific inaccuracies it contains. What will happen if you eat high GI carbs and dont use it as energy, but your muscles and liver sores are depleted, would it store it in your cells for further use? Yes, it would be stored in those tissues as glycogen. people to continue to overeat. response to low blood sugar. (or keeping) the body in a state of ketosis. versus the high carb meal? Thanks for your comment. I disagree with your comment because it focuses solely on insulin and ignores all the other hormones and factors that affect fat metabolism. Also, there are some errors in your comment. For example, glucagon stores are not depleted; glucagon is a hormone. Perhaps you are referring to glycogen. Another reason I disagree with your comment is that it is focused purely on the postprandial period (the period shortly after a meal) and ignores what is happening over a 24-hour period. What really matters is 24-hour energy and fat balance. The primary mechanism behind how low-carb, high protein, high fat diets “work” has nothing to do with insulin, and everything to do with the appetite suppressant effect of the protein intake, along with a mild appetite suppressant effect of ketosis. The bottom line is that people spontaneously eat less on these diets. “you would eat a low protein, low carbohydrate, high fat diet. However, I don’t see anybody recommending that.”…. just wow… Now I know that you haven’t really read any of Taubes’ books. This is exactly the diet he recommends. In fact Taubes doesn’t necessarily tries to ban all carbohydrates from our diet (he recommends to eat plenty of vegetables where sugars are bound to fibre) but to include more natural occuring fat. Yes, I have read Taubes’s books. And Taubes says very little about protein in his books. Note that I said “low protein.” In fact, Taubes’s ignorance of the powerful impact of protein on appetite and lean mass retention is one of the major shortcomings of his books (among many shortcomings). Quick question re insulin : I’m playing around with dextrose in my water while i weight train. And some times, not every time, i get the symptoms of low blood sugar post workout. Its usually after my shake ( 40g whey protein in water ) and before my next meal i get the trembles, get very irritated and hangry (hungry / angry )… It goes away about 15 mins after i eat carbs. Does the low blood sugar mean i can increase the amount of dextrose in my water and provide more sugar for glycogen replenishment thus limiting the chance of low sugar? Should i lower the amount of dextrose so the insulin spike isnt as hard and doesnt give me low blood sugar as quick? Insulin secretion is usually suppressed during training so you really won’t be getting too much of an insulin spike anyway from the dextrose. But, the dextrose is likely being taken up my muscles fairly quickly because of your training. Whey protein mixed with water will also be absorbed quickly as well. My thought is that you are consuming two “fast-acting” substances…dextrose, and whey…and thus there’s nothing to help maintain blood sugar and suppress hunger for an extended period of time before your next meal. My suggestion would be to include some slower acting protein along with your whey (like casein), and perhaps some slower-digesting carbs as well. The real question: what slower acting carb would you recommend? Would maltodextrin do the trick? And what if the goal is to eat more calories, i.e., what if being hungry after would be considered a win? Would we still want to go for more slowly digested sources of protein and carbs? p.s. Amazing post – pumped to read through the rest of the series! Maltodextrin is actually not a slower acting carb. Slower acting carbs would be ones that contain some fiber, and come from whole food sources. Oatmeal would be one example. Yes, if your goal is to ingest more calories, and you are an individual with appetite issues (meaning you have trouble eating enough to gain muscle), then getting hungry definitely would be a win. Ah great, thank you James! I’m 20 and i’m a fan of training using Kiefer’s Carb-Back Loading technique, which you surely know recommends eating fast-digesting carbs after exercise. I understand that this happens because the insulin spike caused by those carbs drives those carbs into muscle as glycogen after intense workout, are my thoughts right? Another thing concerning fruit, what is “fructose” really? would it be a fast or slow-digesting type of carb? It would be great if you claryfied this for me. PS thanks for all these info it really helps!! While it is correct that your muscles are more sensitive to insulin after exercise, and will take up carbohydrate more quickly if you eat fast-digesting carbs after training, it’s not really relevant unless you are training multiple times per day. Most people don’t train the same muscles twice per day, and thus glycogen is easily replenished by the time the muscle is trained again. Thus, there is no need for “fast-acting” carbs after an intense workout. Fructose is technically a slow-digesting carb, because it is metabolized by the liver first. Thank you for the info James! But… when insulin levels are low activation of LPL is upgraded, which does not breakdown fat inside adipose tissue but releases it from the fat cells into the bloodstream where it is easily taken up into muscle cells and used as energy there. This is a much more efficient way of “losing” fat, wouldn’t you say so? The activity of LPL does not exist in a vacuum. There is complex interplay between LPL, HSL, and various other hormones and other factors in the body that regulate fat metabolism (such as catecholamines). This is why it is a mistake to focus on a single hormone or enzyme. Also, keep in mind that LPL is only responsible for breaking down triglycerides into component fatty acids. This does NOT mean those fatty acids will be oxidized. In fact, those fatty acids will simply be repackaged back into triglycerides, unless they get oxidized due to the need to obtain energy from being in an energy deficit. This is why calories still ultimately matter. Reading your article along with several others on the topic of insulin, a question comes to my mind which i can’t really decipher on my own. After my workout which is glycogen depleting, it lasts around 4hours(no training critiquing please), I consume around 50gms of whey protein. now this dose of whey protein Post workout will elicit an insulin spike i understand that, but since i’m consuming no carbs alongside it, what would be the situation with gluconeogenisis according to you?If I put it more simply, would the dose of protein be shuttled to my muscle cells as amino acids or will a part of them be converted to glucose, I’d love to hear your opinion on this. ALSO, i consume a high protein, high carb, medium fat meal around 2-3hrs after my post workout protein shake. And sometimes I would consume a small amount of simple carbs during my workout…but thats not something I do every workout. Mann, the consumption of purely whey protein, and little to no carbs, will cause insulin release along with simultaneous release of glucagon. This will stimulate gluconeogenesis in the liver to help prevent hypoglycemia, which would occur in the case of the insulin surge if you didn’t get the simultaneous gluconeogenesis. First time I’ve visited your blog and this article is very interesting but boy am I confused! Everything I have read about insulin response (including the nutrition course I’m currently doing) says that simple carbs cause a major insulin spike followed by a fast drop leading to very low blood sugar and causing tiredness and hunger and mood disturbances. This is all wrong?? I can say that when I have eaten high amounts of simple carbs in a meal I get heart palitations and extreme feelings of lethargy, but not hunger just more carb cravings. Perhaps you can help me out on what exactly is happening in this situation…? Also I’ve read stories of people on low carb diets who insist they ate plenty of food (more than when they were on calorie controlled diets) but lost weight effortlessly. According to what you say, the only reason low carb diets work is due to appetite suppression is that right? But I also read an article by Lyle McDonalds where he explains the reason low carb diets help with fat loss is down to the higher thermogenic effect of protein than carbs and therefore more calories are burnt by replacing carbs with protein and consuming the same amount of calories…what are your thoughts on that? Take a look at this article and this will help clarify insulin’s role in the body. Simple carbs do not always lead to insulin spikes. For example, fructose is a simple carb but causes very little insulin release. Lactose is a simple carb but does not cause big insulin surges. There is isn’t a lot of evidence that simple sugars will cause rapid rises in blood sugar, followed by rapid falls and hunger/mood disturbances. The reality is that appetite, mood, tiredness, etc are all complex issues affected by a variety of factors. Regarding people on low carb diets, the reality is that people in general are very bad at knowing how much they are really eating. Even professional dietitians have been found to be inaccurate in tracking their food intake. Yes, the real reason low carb diets work is due to appetite suppression. 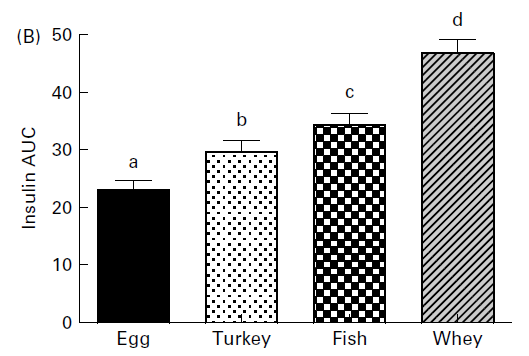 The higher thermogenic effect of protein can play a small role, but it’s only small. Hi James, thanks for the reply. I’m aware that it’s glucose that affects blood sugar, I didn’t think about all the other simple carbs that don’t affect blood sugar. The thing is about blood sugar crashes that I mentioned only happens to me when I eat high carb foods. A meal with meat, veg and fat doesn’t affect me badly in that way. I also did a little experiment this week where I was eating mostly potatoes and I had awful hypoglycemic episodes – got shaky, sweaty, ravenously hungry, fatigued and it only improved when I ate something with glucose in it. If it wasn’t the potatoes doing this to me then what else could it be? Some of my meals had tiny amounts of protein added and sometimes a little fat, but the only meals that didn’t cause hypoglycemia were my evening meals and they had a little bit of fat added. I appreciate that this effect doesn’t happen to everyone who eats a large amount of carbohydrate in a meal, but isn’t it possible there are many of us who don’t deal with carbs as well as others? I’ve read that diabetics have to be careful of injecting too much insulin because of blood sugar crashes. I’m confused as to how people become insulin resistant if it isn’t from chronically elevated insulin from eating too many sugars. Other simple carbs do affect blood sugar. All digestible carbohydrates affect blood sugar…they just do so to varying degrees. Yes, some people don’t deal with carbs as well as others, but this more relates to insulin sensitivity and resistance, not insulin itself. Chronically elevated insulin is a product of insulin resistance, not the other way around. Insulin resistance has many causes, but in general, too much sugar only significantly contributes to insulin resistance if calorie intake exceeds calorie expenditure, unless the sugar intake is insanely high. Hi James, thanks for clarifying about IR. It’s obviously something I need to do a lot more research on because it’s something I clearly don’t understand fully yet. Of course many people who eat plenty of sugar but don’t gain weight don’t seem to automatically get IR or type 2 diabetes so it makes sense for it to be in the context of calorie consumption and weight gain. I’m not IR to my knowledge – I had a GTT done when I was diagnosed with PCOS a few years ago and it came back negative for IR – but I must be resistant to some degree in order to have hypoglycemic episodes at all I guess. I don’t know what has made me this way but I guess poor diet over many years, PCOS and an eating disorder may have all contributed. I’m hoping I can now improve my sensitivity with a healthy diet and exercise and hopefully that will lead to some weight loss as I’ve been trying unsuccessfully for years to get within my healthy BMI. Hi, Thanks for the article. How does this apply to someone with PCOS? Running for four years. First 10K coming up. I still am just under, by a hair, of obesity. I can’t lose the weight no matter how many carbs I cut, no matter how much protein I eat, no matter what kind of diet. I’ve been to many endocrinologists, snake oil “experts,” spent *thousands* on supplements, everything you can think of. I will die from this if i can’t lose the weight. I found your site from a search. Is there any hope? I’m tired of snake oil. Yes, there is hope. While people with PCOS have a more challenging time with fat loss (mainly appetite issues due to insulin resistance), it can be done. The corporate weight management program that I used to work for had success treating PCOS clients. But it took a team of people working with the individual…a physician, dietitian, behavioral therapist, and personal trainer. Have you tried resistance training? It can really help with insulin sensitivity.